I learned a whole lot on Saturday afternoon. First: I boiled some of the larger potatoes we grew, slid them out of their skins and – following the directions of Marcella Hazan, Italian food queen – put them through the food mill. Then the learning began. Marcella said to mill them directly onto the work surface. It seemed awkward, but I threw some AP flour on the work surface and started milling. Three potato halves later, I was like, ‘Torturing myself is fun and all, but I need a way to stand this thing above this surface. If only I had a sturdy tube.’ I rested the food mill on top of the empty angel food form et voila! The food mill produced a whole lot more potato than I expected. Marcella’s recipe uses only potato and AP flour. The potato had nice flavor, so I went with it. I kneaded the flour and potato and it became a dough. I cut it into quarters and rolled it into long tubes. I tried out cutting 3/4 inch bits but they seemed large. Smaller turned out to be better. I have a gnocchi form and at first using it was strange, but very quickly I learned a smooth motion. That by itself was very encouraging. 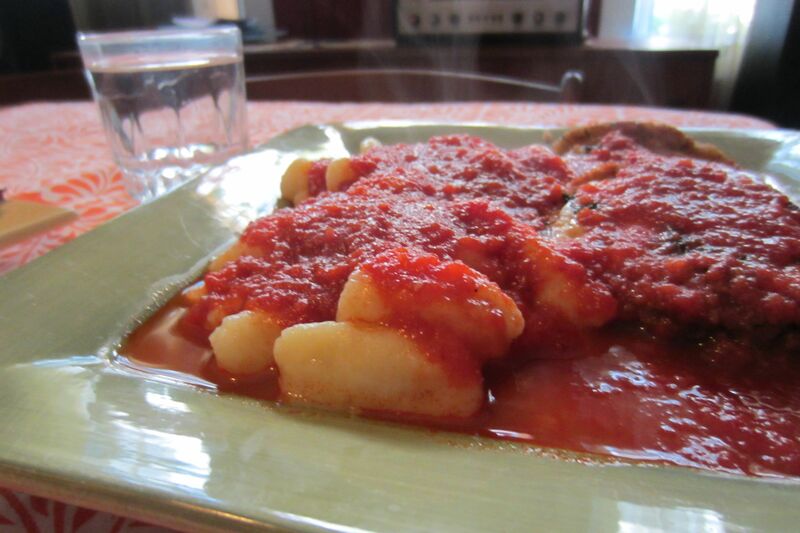 I put the formed gnocchi on a 1/2 sheet pan lined with wax paper and dusted with AP flour. The filled tray went into the freezer, for a little extra insurance. Later, we dropped them into boiling salted water and they came back to the top immediately. I expected this to take a few minutes, but no. Steve was concerned about how soft they were so were plated them directly from the boiling water. He mixed the gnocchi with sauce very carefully. The texture was extremely light but too light. Steve remembered that his grandmother would rice the potatoes and let them dry for a few hours or overnight. I made terrible gnocchi! From scratch! 1. Station the food mill over an empty angel food pan and a base of AP flour. 2. Mill potatoes and let ’em get some air. 4. Roll the dough smaller than you want to and cut the little chunks small. 5. You WILL get the forming motion, so quit whining. 6. Some time on a lined, floured cookie sheet in the freezer helps. I had worried this would be hard to do, but it is not. It is completely easy. Can’t wait to try again. This entry was posted in compote something and tagged extra insurance, food mill, marcella hazan. Bookmark the permalink.